This guest post is by Kristen, a waiting adoptive parent. I click on my email inbox. Yet again it’s empty. Or, as is more often the case, spam. The type of spam that advertises sales from a website I may have clicked on once, or someone trying to sell me medications not even suited to my particular gender. I scowl, delete it all and distract myself with checking over our baby essentials list. I’ve fallen into a routine of checking my email no less than 10 times a day (okay, maybe more like every hour or so, but who’s counting?). I check our blog and Facebook page to see if anyone has checked us out from our Canada Adopts! profile. I wash the curtains and vacuum the carpet in what will be the nursery, in case of a last minute placement. When my phone rings I pounce on it like a cheetah, just in case it’s our agency. I admit I was a little naive when we went into adoption, thinking that waiting would be the easy part. I thought that the waiting portion of this process was passive and life would just go on as normal, until eventually, we would get a phone call from our agency telling us we may have a match. I really should have known better. I’ve always been more of a doer than a when-it-happens-it-happens type person (luckily, I married that type of person). Months ago someone asked me when we would be placed with a child. I replied, “Anytime between now and never”. I admit I was oversimplifying my feelings because I wanted to avoid explaining. There is a belief with those unfamiliar with the adoption process that you are placed on a list and when you get to the top, it’s your turn. I’ve explained quite a few times that in private domestic adoption there is no timeline, you are chosen by the birth parents. I really should be a pro at waiting by now. Between trying and infertility treatments, we’ve been waiting nearly four years to welcome a little one into our life. Why would this be any different? 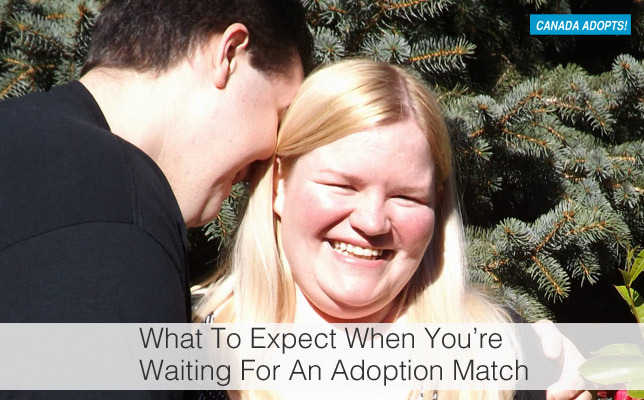 But the adoption wait is a beast unlike any other. The wait tests you in a way that I was not prepared for, and it’s hard to compare to anything else. It tests your ability to hope despite fear, to believe you’re good enough to be chosen despite doubt, and your willingness to plan for something with no guarantees. It’s being prepared for your life to change with the ring of your phone. Instead of waiting on your body, or the next infertility treatment, you wait to be chosen from amongst many other couples just as qualified as you to love and raise a child. Fear and doubt can creep in. Are we likeable enough? Are we attractive enough? Do our lives sound exciting enough? Or does it sound too boring? I found myself questioning if our house was too small, or if we would be judged by our lack of travel, or that our profile didn’t have enough pictures of us with kids (I was against borrowing the children of friends that we rarely see just for the sake of pictures). The biggest fear is that you won’t be chosen; the days changing to months and then to years without a placement. We were advised by one of our adoption professionals that if we require a homestudy update (which is every two years in Ontario), that’s when we should re-assess if we want to continue waiting. The next biggest fear is that you will be matched, but ultimately the expectant mother will decide to parent. Your deep yearning for a child is tempered with the knowledge that your greatest joy will come at someone else’s grief. That while you are wishing for time to hurry up, someone somewhere may at the same time be willing it to slow down. The difficulty of waiting forces you to remember it. To remember how it felt when in the future, at 4 a.m. you are rocking a little one who only wants to sleep in your arms, or on the nights that are spent sleeping on the floor next to your baby’s crib because he’s come down with croup. To remember to uphold all the promises you made to a woman who wanted time to slow down. I’ve met some wonderful people while we’ve been on this journey. Some are adoptive parents who have been waiting longer than us, some less. Some have been matched and had it fallen through. Some are holding their children now. Some are birth mothers; lovely, beautiful women inside and out, who humble me to my core. Whether your wait hasn’t started yet or has just begun, it’s the hardest part of the journey. But as uncomfortable as it is, waiting serves a purpose –to prepare you for all those difficult days and nights you’ll have as an adoptive parent. And in the end, it will be entirely worth it. Kristen lives in Ontario, Canada with her husband James and black cat, Harley. They are currently waiting to adopt their first child through open adoption. Do you have an adoption story or are looking to reach out to others in the adoption community? We’d love to share it with your community. Email us any time or find details here.